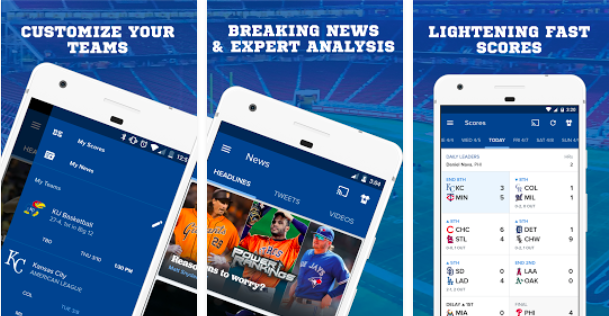 This sports app is a go-to source for MLB, NBA, NFL, NHL, MLS and NCAA sports news, scores, and more. This one-stop sports app is available for all of your electronic devices, such as iPad, Apple Watch, and Apple TV. Besides offering a large amount of features, like lightning fast scores, stats, and news, CBS Sports also offers a wide variety of different games you can interact with and even receive weekly cash prizes. In order to get started, you can find the app in Google Play and iTunes Store for a free download. Once you have completed the download on any of your devices, you are ready to indulge in all of the amazing features the app offers. The app has a great look and feel to it, and offers you the ability customize your feed to match your favorite teams. That being said, when you first launch the app, expect to look through and select each of your favorite teams by searching through each sport category. Once you have customized your feed, make sure to allow push notifications so that you can be alerted about updates, such as scores, upcoming games, and stats. After you completed those steps, you will advance to the homepage of the app where you can toggle between scores, news, and teams. The app has a very friendly user-interface. You can easily navigate between sports, leagues, and teams. The ability to cater your news and notifications, to your personal preference is easily manageable by simply selecting what you want to see. At the bottom of the app, you will find three tabs: Scores, News, and My Teams. For each tab, it will show only the news you want to see, in order to add another team, you simply select add at the top of each tab. Think of the My Team tab as your home base for your favorite team. If you want to see something regarding your team, whether it is news, standings, or stats you can simply go there for your one-stop feed. If you hit your side panel tab at the top left of the page, you can also check into live radio Ex. Tiki and Tierney. You will also find access to College Sports Live and the CBS Sports Network there. CBS Sports Radio: Ability to live stream radio by simply pressing volume on or off to hear the latest gossip. Chromecast Enabled: Option to cast CBS Sports on demand and live video to your TV, and control video playback and volume directly from the app. Live Video: Get on-demand access to highlights, analysis, and original video programs. News, Standings, and Schedules: Personalize teams news and tweets you wish to see. Standings for every league, including college rankings. All of your teams schedules are easily displayed in one platform. Special Events: Access to a multitude of events, such as: NCAA March Madness, NBA Draft Day, PGA Tour, and more! Overall, the app is very useful and clean-cut. There are not a lot of distractions, that being said there are some banner ads occasionally, but they no disrupt the usability and enjoyment of the app, which in most cases they do. The app is well organized and pretty straight forward. You can select what you want to see and about whom. Once you are done managing what you want to see, the app really does give a personalized touch and feel when navigating through the content. Besides for the apps main intended purpose, the extra features are entertaining depending on what you are into. All in all, CBS Sports app is a reliable source for all your sports needs. CBS has a lot of Insider Information, which helps you stay up-to-date with what is going on around the world. I really enjoyed the look, feel and use of the app, i suggest downloading it for free on Google Play or iTunes Store.